This photo from our first hike to the summit overlook at Pine Mountain Recreation Area tells why I’m adding it to the series: Fantastic Fall Hikes near Atlanta. Winding through the woods to the highest point in Cartersville, Pine Mountain West Loop is reminiscent of a visit to the mountains of North Georgia. The trail quickly climbed to the top of our favorites for several reasons: heavily-wooded winding trail with well-managed elevation change, stunning rock outcroppings along the way, close to home and a spectacular view from the summit. The Pine Mountain Recreation Area boasts several miles of trails, including mountain bike tracks (on specified days). 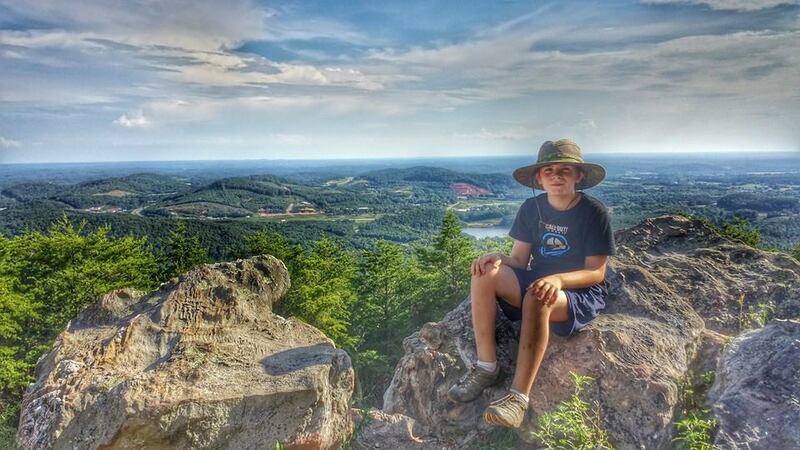 We limited our hikes to the Pine Mountain West Loop and Summit Overlook. This provides us with almost 2 miles of hiking. The trail can be rugged, in places, and offers a challenging hike for youngsters. 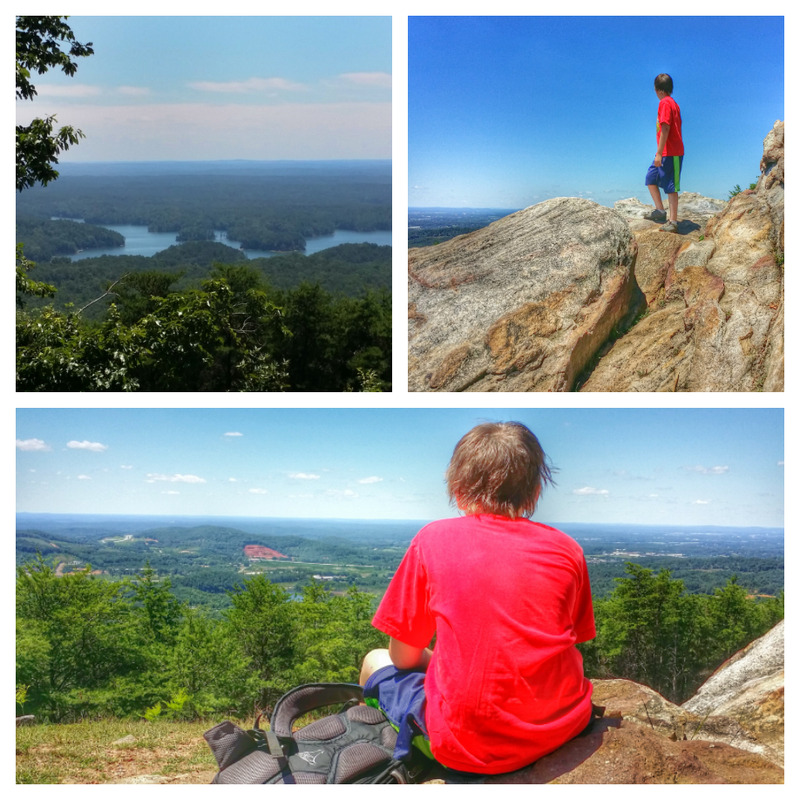 I would recommend tackling some of the easier mountain hikes such as Stone Mountain, Arabia Mountain or Kennesaw Mountain before embarking on this one with little tyke hikers. Apart from the summit view, hiking the loop clockwise presents striking scenes of rock outcroppings that prove lots of fun for adventurous climbers. While hiking the trail clockwise is our preference, we found hiking counter-clockwise to be an easier option with less obstacles and ruggedness on the way up. Pine Mountain Recreation Area is teeming with interesting life. We’ve watched strange insects clamber around rocks and boulders, listened to bird songs and examined a variety of plant life along the trail. It’s a serene getaway just a short drive from the hustle and bustle. “It’s cool…and the summit looks nice…and the view is amazing.” Too cute…and true! 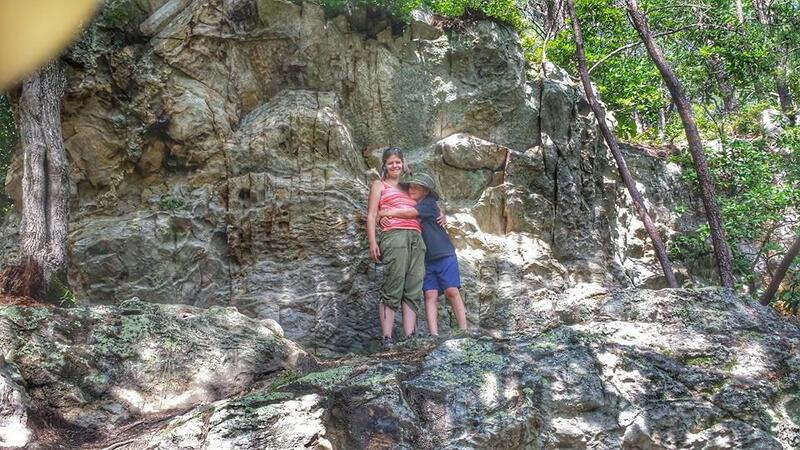 My husband and I took an impromptu hike through the Whiteside Mountains in NC in August. We had a great time! I’d definitely like to try another hike. Even though we don’t have any young tykes, I think we will take your advice and try Arabia Mountain first; I’ve been wanting to go there. It’s beautiful. If you go soon, you will see the stone mountain yellow Daisies still in bloom. Go the day after a good rain so there will be pools of reflective water for a beautiful view! The views are amazing! I will have to check that out with my older boys!